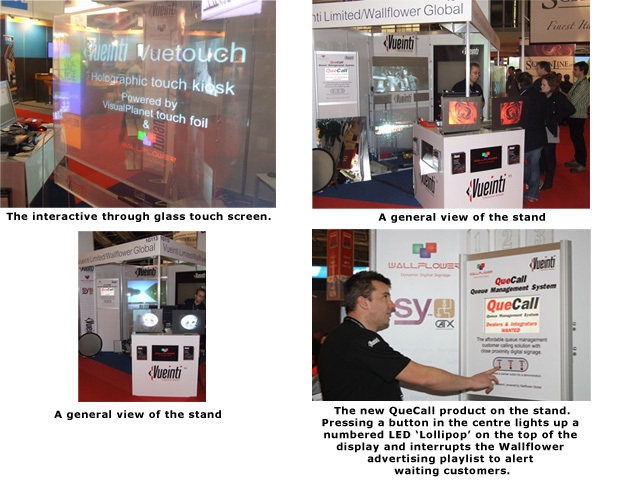 The joint Wallflower Global/Vueinti stand at ISE Amsterdam was received enthusiastically. On the stand visitors could see examples of Wallflower driving a variety of displays. Great interest was shown in the launch of the Que Call queue management system. Visitors could interact with a live demonstration of the system in action. The touch enabled holographic display proved a hit with many visitors. The demonstration showed how a back projected through glass touch screen can be implemented. The Wallflower player driving the screen also drove a further 3 displays of different sizes. The touch screen could be used to investigate how the Wallflower Navigator operates as well as selecting a range of media to display on the other screens. The touch menu was implemented completely using the Wallflower Scheduler touch creator. Other displays showed the versatility of Wallflower to drive a variety of displays types. A significant number of prospective Resellers and users came through the stand. The numbers were considerably up on the DS Expo at Olympia last year.